Hi all: I want to update you on the progress of John Elliott and my book “Inside the Walls: The Final Days of the Lincoln Conspirators”, but first, a little business to attend to. First of all, thanks to everyone who has complimented me about my blog. Although I haven’t had much opportunity to write recently, it is very rewarding to know that you are enjoying the content that is here. And thank you for understanding why I’ve restricted access to the 15-chapters on the Lincoln Conspirators Execution Photos: A Study in Detail. This is the precursor to our book and some of the content no longer is valid. So for now, I need to keep it inaccessible until the book is released and the content updated. Secondly, thanks to everyone who has signed up for the Inside the Walls Book Update List. The list grows everyday and we are so happy that you are anxiously, and patiently, waiting for it. If you want to be on the list and have not signed up yet, please email me at outreach@awesometalks.com, write “BOOK” in the subject line and leave your email (and name if you like). I will add you to the list. The last update was sent out in October, 2010 so if you are on the list already and haven’t heard from us, you have not missed anything. Finally, thanks to the folks who have visited and joined us as friends on our Facebook page “Inside the Walls”. We love hearing from you. To get there easily, go to the top of my home page and click on the Facebook link at the upper right hand side. 1. When will the book be released? John and I had hoped to have it ready and published by March, 2011 but that is not going to happen. We both have run into busy ‘real work’ situations and our paying jobs have taken center stage. Our new anticipated release date is now sometime this summer 2011. We are going to self-publish the first edition and then see how it goes after that. 3. Is there anything we can see regarding your presentation or the book’s content? As part of our conference offering, we are planning to produce a printed supplement (specifically made for the conference) which will both highlight our live presentation and give a very good synopsis of the content in our upcoming book. Although details are not completed yet, it is very likely that we will offer it to the public after the conference. Costs and other details are still pending. 4. Have you had good support from the Lincoln Assassination Research community regarding your book? John and I are overwhelmed by the great support we’ve had from fellow researchers, authors, supporters, friends and others. The book will not only include our own research but will have written articles by Steven G. Miller and Dr. Blaine Houmes (who are both speaking at the Surratt Society Conference this year). As well, we have been given some amazing photographs and research specifically related to our subject. I won’t name names at this time for fear that I will forget someone, but there have been many and we can’t thank them enough (but certainly will in the book). 5. Have you received any endorsements yet? Yes we have. I believe we have 5 or 6 to date. I can also confirm that our Forward has been written by Frank J. Williams, Chief Justice (Ret.) of the Supreme Court of Rhode Island; Former Chief Judge of the United States Court of Military Commission Review for Appeals for those detained at Guantanamo Bay, Cuba; and the Chairman of the Lincoln Forum. Not bad, eh! 6. Who designed the cover? John and I worked through numerous versions of the cover design until we decided upon the one above. The initial concept was John’s and I did the final graphic layout for it. 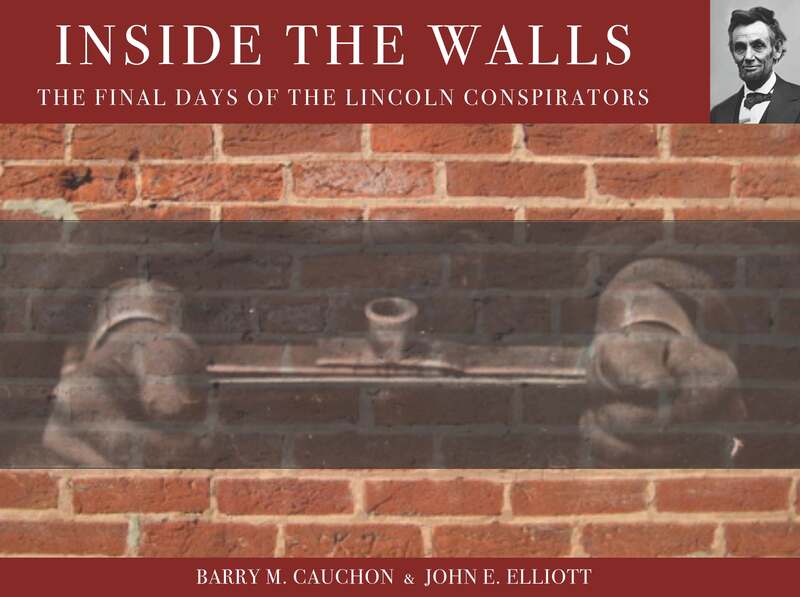 The photo on the cover shows a brick wall with a ghosted image of a prisoner’s wrists restrained in Lilly Irons (sometimes called Lilly Bars). The photograph of the bricks is from the wall that surrounds Fort Lesley J. McNair in Washington D.C. Fort McNair is the site of the former Arsenal Penitentiary where the conspirators were incarcerated, tried and for some, hanged. When the penitentiary was demolished in 1867, these bricks were stored and later reused to build the wall that currently surrounds the site. The image of the Lilly Irons is taken from an Alexander Gardner photograph of conspirator Edman Spangler, who was held at the penitentiary. The main idea of the cover design was to give you a sense that something ominous was occurring behind, or Inside the Walls, inducing the reader to investigate further. 7. How is the book laid out? Assuming we don’t change our direction at this late date, the book is broken up into several parts. Part I is the back story. Part II covers an in-depth look at the Arsenal Penitentiary and some of the events that occurred there right up to the morning of the executions on July 7, 1865. It will also feature the events and stories (some surprising) told by the people who witnessed them. As well, the chapters in Part II will analyze the architecture, the cells and prisoner locations, and some of the people themselves. Part III will cover the executions of the four condemned conspirators including a detailed forensic analysis of the Alexander Gardner execution photographs. The book will end with the stories of the fates of the remaining four conspirators and other ‘persons of interest’. We are excited to share our work and are working hard to complete it for you. A young boy (left) views the hanging bodies of Mary Surratt and Lewis Powell on July 7, 1865. This week, I had a series of emails from Professor of History, Martha Sandweiss at Princeton University. She had read my article from March 07, 2009 called Who Was the Boy at the Hanging (Lincoln Conspirators Execution Photos). This features a story by researcher Steven G. Miller based on a 1914 Washington Star article sourced by Michael Kauffmann. The piece focused on trying to identify a boy found in one of the ten Alexander Gardner photographs of the Lincoln conspirator executions. In the photograph, the young boy stands fixated in front of the scaffold gazing upon the lifeless bodies of the four executed conspirators. Professor Sandweiss complimented the story and says the Miller article is an excellent hypothesis. But she believes that the image of the boy, identified as John C. Collins, seems to show a boy much younger in age (8-10 years old) than Collins was on July 7, 1865. Collins was born on September 19, 1850 which would have made him 14 years old at the time of the executions. Professor Sandweiss believes that there is about a 4-6 year difference in age between the boy in the photo and Collins. How old is this boy? As part of Professor Sandweiss’ research into the story about this ‘boy’, she has questioned the reasons for this age difference. She concedes that Collins was probably at the hangings but challenges whether the image is actually of him? Could this be someone else? Are there records of other boys attending the executions? To answer the last question, I can tell you that there was at least one other boy present. The person I’m referring to was Alfred C. Gibson, one of General Hartranft’s clerks. At the time of the executions, he was probably around 16 years old. In two different newspaper interviews given between October, 1927 and April, 1928 (over 62 years after the executions), Gibson claimed he witnessed the executions and stood about ten feet in front of the scaffold and George Atzerodt’s position. Gibson’s statements should be taken with a grain of salt as some of his ‘memories’ conflict with other first person eyewitness accounts. But if his recollections are true, and that he did indeed stand in front of the scaffold, then it is not far from the location where the ‘Boy at the Hanging’ is found. As tempting as it is to suggest that Gibson could have been the ‘boy at the hanging’, I personally believe that this is not the case. The main reason is how the boy in the photo is dressed and equipped. Gibson had a room inside the penitentiary so he would not have needed to carry a gunny sack or other field equipment. John C. Collins or another field soldier, would more than likely have needed these items. Does this help Professor Sandweiss to further her research? Perhaps not, other than to show that at least one other young boy was present at the hangings. Since that is the case, there is no reason to believe that others were not there as well. If this boy was not John C. Collins or Alfred C. Gibson, then I’m at a loss to know who it could be. To date, I have not come across any research that suggests any other boys there that day. I am sure that some of you are going to point out that the professor’s assertion about this not being John C. Collins, is based solely on viewing just one photograph. It is subjective and based on opinion rather than scientific fact. Other viewers might be perfectly content believing that the boy in the photo is fourteen. These are all fair statements but please let me be clear about why I posted Professor Sandweiss’ challenge here. Especially for you junior researchers, this is an important lesson. Where research is concerned, I am a huge believer in the need to challenge the status quo. Do not take history at face value. Don’t believe one version of history is correct just because it seems plausible without checking and cross referencing as many other sources as you can. I can’t tell you how many times my mind has been changed about something because better evidence was uncovered to disprove my former belief. When Professor Sandweiss challenged whether the boy was 8-10 versus 14 years old, it wasn’t to be subjective about it. The age conflict didn’t sit right with her and it compelled her to investigate the subject further. And now she is actively seeking the truth. That is one way how research starts. Curiosity. Enlightenment. Challenge. Seek out more information to find the truth. Research, research, research. Cross reference. Challenge your own results. Research, research, research. Always be open to other possibilities. Believe your theory if it is plausible. If doubts remain, challenge those theories again. Never stop looking for answers. I encourage people to weigh in on this subject. Whether you wish to comment on the story of John C. Collins or discuss research methodology, I’d love to hear from you. Steven G. Miller knows more about the hunt for John Wilkes Booth and the men who participated in it than most people in the world. He has been researching the subject for thirty years. However, if you try to call him an expert in the subject he frowns upon the title. There is just too much more to learn so an expert, he says, he is not! Despite Steven’s objections, many of us believe that he is an expert and the best person to talk to regarding the hunt for John Wilkes Booth and what really happened in his final hours. Steven is a gifted researcher, writer and historian. He has written numerous articles for magazines and periodicals and has one unpublished book about the eyewitness accounts taken from the Garrett farm the night John Wilkes Booth was captured and killed..
I’ve known Steve for about two years and he always has something amazing to share. He’s also a pretty humorous guy with a really dry wit. Steve will be speaking for the sixth time at the Surratt Society Assassination Conference in Clinton, MD next March 19, 2011. For more details, go to the Surratt Society website at: www.surratt.org. 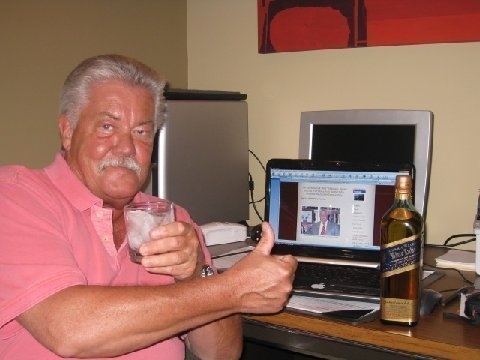 Barry celebrates the 400,000th hit to his blog "A Little Touch of History". Hi all: On February 16, 2010, I posted a big thank you to all my supporters for A Little Touch of History as it had just reached 300,000 visitors. Well, here we are 5 months later and now this little blog has topped the 400,000 mark. Awesome! I can’t thank you all enough. I am truly proud to have been able to bring you this blog over the past 2 years and 2 months. And the tremendous encouragement from my friends, colleagues, readers and supporters has been nothing short of outstanding. I will always be grateful. As A Little Touch of History moves towards its next big milestone (the 500,000 mark) I am thinking about what features you would like to see here. So please drop me a note and tell me what you like, what you don’t like and suggestions on what you’d like to see. Maybe something local, or someone who has a connection to history. You never know who has an interesting story to tell. Traditionally, I reduce the number of features and articles I post during the summer as schools are out and my readership is lower. This gives me a chance to catch up on my own research so that I can present it to you during the rest of the year. But as a bonus for my dedicated summertime followers, I have a SUPER DELUXE SUMMER SPECIAL to help celebrate A Little Touch of History‘s 400,000 hits, I am announcing that I will be posting a couple of brand new interviews in the few weeks. The first was recorded on July 17 with Steven G. Miller. Steven is considered to be one of the most knowledgable experts on Boston Corbett & the men of 16th NY Cavalry (the men who tracked down and captured/killed John Wilkes Booth). The piece is just going into editing but I suspect that the final version will be published in less than two weeks from now. The other interview is currently being scheduled for recording with Cynthia StormCaller, the curator of the Drummer Boy Civil War Museum in Andersonville, Georgia. Cynthia will walk us through the museum’s collection. If you plan on being in the Andersonville, Georgia area later this summer or fall, this will be a good primer for visiting the museum. I am hopeful that this interview will be completed and published by early August at latest. Again, thank you all for your continued support and let me know what you’d like to see in the upcoming months. March 15, 2010: Barry Cauchon. Hi all: I am pleased to announce a partial list of upcoming interviews planned for my 2010 series “An Awesometalk With”. Last year featured some wonderful interviews and this year will be no exception. Here are just a few of the folks who have agreed to share their thoughts with you on “An Awesometalk With”. STEVEN G. MILLER, historian & Boston Corbett expert: Steven is considered to be one of the top experts in the world on the 16th New York Regiment and Sergeant Boston Corbett, the man who shot John Wilkes Booth. Steven’s interview was done some time ago but I only recently completed transcribing it (sorry for the delay Steve). Look for it here very soon. It has some great content and stories (interview completed, edited and awaiting approval). MIKE KAUFFMAN, historian and author of American Brutus: Mike is one of the foremost Lincoln assassination experts in the world authoring numerous articles on the subject. He is most well-known work is American Brutus: John Wilkes Booth and the Lincoln Conspiracies. Within Lincoln assassination research circles, Mike is highly respected for his research capabilities and being able to find historical information that escape many of us. Mike will share his insights into how to research an old story in new ways and the many angles one can take to find new material. LAURIE VERGE, Director, Surratt House Museum: Laurie has been the Director of the Surratt House Museum in Clinton, MD since 1983. Anyone who has ever studied the assassination of Abraham Lincoln (from students, authors, film makers and scholars) knows Laurie, and has probably been helped by her at some point over the years. Laurie is a true matchmaker, directing the folks ‘with questions’ to the people who have ‘the answers’. She has been a tremendous supporter of mine and I’m very excited about introducing Laurie to you soon. GLORIA SWIFT, Museum Curator, Ford’s Theatre, Washington D.C.: When Gloria phoned me recently and we had a chance to talk, I realized then that we had very similar approaches to history. Gloria has been an interpretive park ranger and curator with the National Park Service, working at such sites as Gettysburg National Military Park, Harper’s Ferry National Historical Park, and Monocacy National Battlefield. Currently she is the Museum Curator at Ford’s Theatre National Historic Site. DR. EDWARD STEERS, JR., historian and author: Ed Steers is one of the most respected giants in the field of Abraham Lincoln’s assassination, authoring ten books on the subject. But Mr. Steers’ interest in history goes beyond the assassination. He is fascinated with WWII and has just released his second WWII book, this one called “We’ll Meet Again: A Story of Love and Intrigue in the Midst of War”. He also has a keen interest in some of the great hoaxes perpetrated on the world, including the highly publicized Hitler Diaries (interview posted March 15, 2010). BETTY J. OWNSBEY, biographer and expert on Lewis Powell, Lincoln assassination conspirator: Betty is the author of “Alias Paine”, the biography of Lewis Powell. She tells me that she loves talking up a storm on Powell and the assassination, as well as on British and American history. I also know that, like me, she is a fan of banjo music and has a collection of old and traditional recordings. Betty has been a huge supporter of the book that John Elliott and I are writing and her submissions and knowledge base have been immeasurable (interview completed and currently being edited). JOHN ELLIOTT, my writing partner and expert on the Old Arsenal Penitentiary architectural history: I can truly pat myself on my own back when I think about how lucky I was in choosing John to partner with to write our book on the conspirators and what happened to them inside the walls of the Old Arsenal Penitentiary. John is an encyclopedia on the assassination and all the peripheral history that surrounds the event. Like me, his real interest in the assassination started as a young student, when he took his first trip to Ford’s Theatre and the Peterson House in Washington. It was the event that started both of our life-long interests in the Lincoln assassination and the happenings at the Old Arsenal Penitentiary. So not a bad starting point for 2010. And there are more interviews to come. I just wanted to share the names of the experts who have already agreed to chat with me. I’m sure you will enjoy them all as each gets a chance to share their unique backgrounds and interests. Here is what I am currently working on for A Little Touch of History. 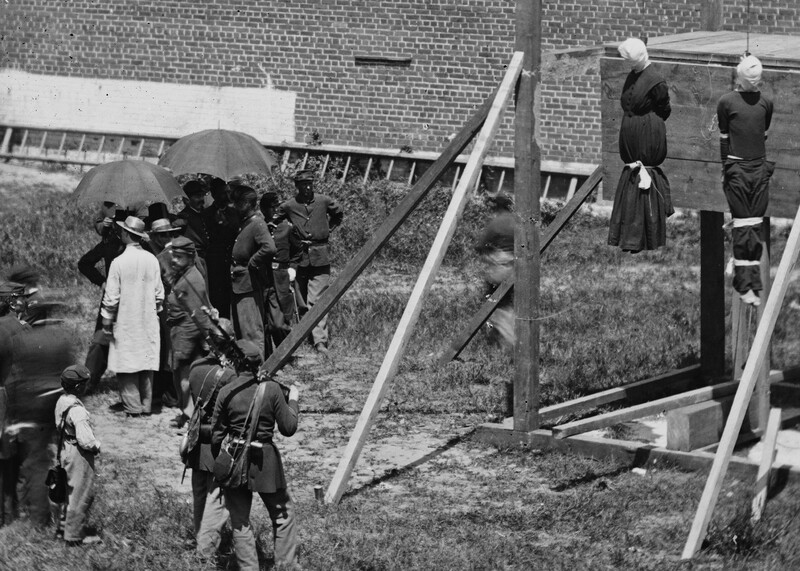 A: “The Lincoln Conspirators Execution Photos: A Study in Detail”. is now posted. Click on the following link to start at Chapter 1 to read the whole series. B. “An Awesometalk With” 2nd Lieutenant George Hauck, 8th Air Force Group, World War II, Prisoner of War. I have posted my interview with Mr. George Hauck (March 31, 2009) who was an airman during World War II. While returning from a bombing raid over Germany in 1944, his plane was shot down and he was taken prisoner. George is a very charismatic man and our talk was extremely enjoyable. You will enjoy his story and his openess about his experiences. C. “An Awesometalk With” Andrew Jampoler, author. Andy is a retired US Navy Captain who has written three books and is working on his fourth. I completed this fascinating interview with Andy on March 26 and you won’t want to miss the stories he had to tell. Andy’s first three books are “Adak, the Rescue of Alfa Foxtrot 586”, “Sailors in the Holy Land: the 1848 American Expedition to the Dead Sea and the Search for Sodom and Gomorrah” and “The Last Lincoln Conspirator: John Surratt’s Flight from the Gallows”. Currently his fourth book, in progress, is called “Horrible Shipwreck”, the wreck of the female convict transport “Amphitrite” in September, 1833. I was riveted as I listened to Andy’s description about all four books and his life in the military. Look for this AWESOME TALK sometime in April, 2009. D. “An Awesometalk With” Steven G. Miller, Lincoln Expert specializing in the hunt for Booth and his capture at Garrett’s farm. Steven was also an expert witness in the 1993 court case to exhume Booth’s body in Baltimore. My conversations with Steven have been fascinating and he is a wealth of information. If you have been following some of my postings, Steve has contributed to some of my stories (look for his reposted article called “Who Was The Boy At the Hanging”. Steve has a lot to share and you won’t be disappointed. The interview was recorded on April 4 and will be published sometime in May/09. E. “An Awesometalk With “Laurie Verge, Director of the Surratt House Museum”. Laurie has been very helpful to me and our plan is to do our interview during the week of April 6 to 10. F. The History of the Construction of the Washington Monument – In progress. G. What’s In A Picture? A Look Beyond the Main Subject – The plan is to study a series of photographs over time and look beyond the main subject. 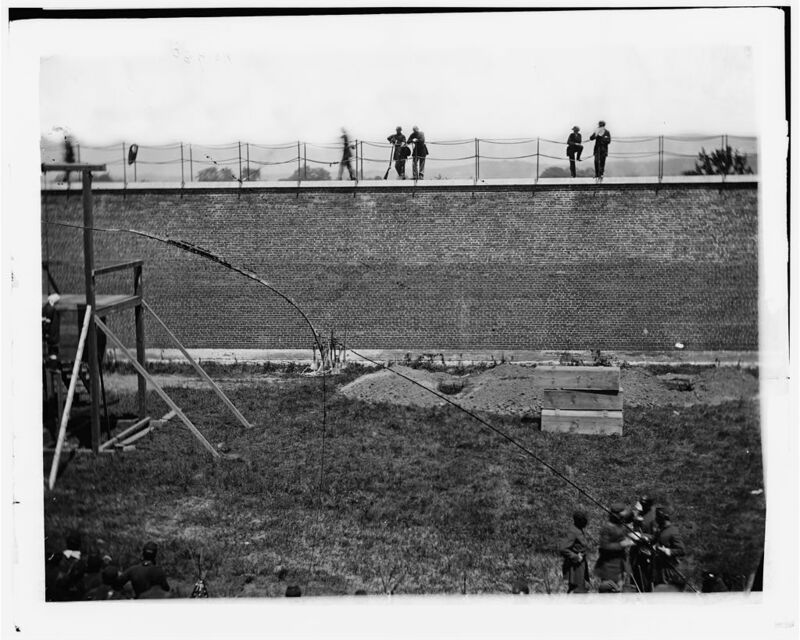 The first one I will review Alexander Gardner’s Rooftop View of the Lincoln conspirator executions from the Washington Arsenal Penitentiary on July 7, 1865. My focus in this photograph will be the Washington DC cityscape seen above and behind the roof top. Current interviews posted on ‘A Little Touch of History’. Yesterday I received a great email from author, Mr. Frank Crawford who has written “PROUD TO SAY I AM A UNION SOLDIER (Heritage Books)”. Frank asked if I could give him more information about the four soldiers who stood beneath the scaffold and sprung the traps on the four Lincoln assassination conspirators. In particular, he was looking for the sources of the information that I had posted. Like Frank, I had initially found conflicting information on the names of these soldiers, so I really wanted to know as close to the truth as I could. Here is what I found out and how I came about that information. If you have any further information on this subject, please feel free to contribute. And please, state any sources that you get your information from. As always, history isn’t always straight forward and contradictory information is common. Enjoy the puzzle. The four soldiers responsible for springing the traps. William Coxshall (front left), Daniel E. Shoup (rear left), Joseph B. Haslett and George F. Taylor. Other than Coxshall and Shoup, the other two soldiers in the photo have not been matched with their names. Two of these names (Hazlett and Sharpe) did not match other sources so I continued my search. Although these men belonged to different regiments in the Union army during the war, at the time of the executions they all belonged to Company F, 14th Regiment, Veterans Reserve Corps. So my first step was to track down their military records. I searched the National Park Service Civil War Soldiers and Sailors System website at http://www.civilwar.nps.gov/cwss/index.html. There, under Company F, I found their names and ranks although some were slightly different. According the the site, the names and ranks were taken from General Index Cards from soldiers’ records found in the National Archives. Here is how the NPS listed the names and ranks below. Private George F. Taylor (but there were also George S. and George W. in the same company). Seeing these differences, I looked for further confirmation to pin down the names and ranks. Kauffman’s source: Coxshall identified the other three in a story in the Milwaukee Free Press, January 31, 1914. Roger Norton recommended speaking to the folks at the Surratt Society, where many Lincoln experts and researchers share information. Laurie Verge of the Surratt Society and the director of the Surratt House Museum www.surratt.org was extremely helpful and sent me the following information based on my inquiry. “The title “The Prop-Knockers” kept ringing in my head, and I realized that the late, great James O. Hall had done a very brief article for our monthly newsletter many moons ago on the subject of the four veterans who stood under the gallows. It was carried in the September 1986 issue. It does not give much biographical detail, and Mr. Hall cites Roger Hunt (another of our members who is great at finding people, especially their graves) as helping him. Soldiers were: Corp. William Coxshall. Co. F., 14th Veterans Reserve Corps. Born in England on July 10, 1843, he died at Beaver Dam, Wisconsin, on April 21, 1922. He is buried in Oakwood Cemetery in Beaver Dam. Pvt. Daniel E. Shoup, Co. F., 14th Veterans Reserve Corps. He was born in Fayette County, Pennsylvania, on January 16, 1839, and he died at Connellsville, Pennsylvania, on February 22, 1913. He is buried in Hill Grove Cemetery, Connellsville. Pvt. George F. Taylor, Co. F., 14th Veterans Reserve Corps. Born in West Gardiner, Maine, on August 11, 1835, he died at Farmingdale, Maine, on December 24, 1915. He is buried in Hallowell, Maine. Corp. Joseph B. Haslett, Co. F., 14th Veterans Reserve Corps. He was born in Indiana, Pennsylvania, on July 27, 1841, and died at Reading, Pennsylvania, on February 16, 1916. He is buried in Reading at the Charles Evans Cemetery. So far as is known, Coxshall’s recollections are the only ones recorded. Dr. Steve Archer found this account in an obscure book about actors and the theater (I can’t remember the title at this moment) while researching his definitive biography on Junius Brutus Booth, father of John Wilkes Booth. Laurie sent this information out to a number of Lincoln researchers and Steven G. Miller, who specializes in the hunt for John Wilkes Booth and the soldiers involved in that chase, wrote back. Steven G. Miller wrote: “The book Laurie referred to is: Harlow Randall Hoyt, TOWN HALL TONIGHT. (New York: Bramhall House, 1955)”. TOWN HALL TONIGHT is about the grassroots of American theater. The author, Harlow Randall Hoyt, was fascinated with theater and published the book in 1955. His work is still used as course material in many universities today. But the question as to why the article called “William Coxshall’s Recollections” is found in his book is strange and seemingly out of place. Author Harlow Randall Hoyt included an article in his book Town Hall Tonight called "William Coxshall's Recollections"
So I looked into it a little bit more and what I found out is really interesting. On the website http://www2.powercom.net/~dchs/Personalities.htm I discovered that Harlow Randall Hoyt was from Beaver Dam, Wisconsin. Lincoln researcher Carl Sandburg (1878-1967) also spent time in Beaver Dam. That in itself is a very interesting coincidence. And of course, the biggest coincidence of all is that William Coxshall (1843-1922) also lived in Beaver Dam and is buried there. Lincoln expert Carl Sandburg spent time in Beaver Dam, Wisconsin which was the same town that Harlow Hoyt and William Coxshall lived in. So it is very likely that these men either crossed paths with each other in the early 1900s, or at least knew William Coxshall’s story from local sources. Michael Kauffman wrote me to confirm that two of the four men can be identified. Coxshall is front left and Shoup is rear left. Haslett and Taylor are both on the right but which one is which is still unknown. As well, the discrepency in rank is on my radar. According to the NPS records from the National Archives, all four men were Privates at the time of the executions. From the Gardner photos, none of the four seem to have stripes on their uniforms. Yet, two of the four are identified in the above research as Corporals. Could they have been promoted after the executions. It’s very possible. If you find other sources for this information, please feel free to let me know. If I can, I’ll be happy to pass it along to the researchers who can see how well it fits into the current historical record. Note: I want to thank Sandra Walia from the Surratt House Museum who also forwarded information to me which confirmed information in this article. A boy stands staring at the hanging bodies of Mary Surratt and Lewis Powell in a close up from the Lincoln conspirators execution photo called "All is Done (1)" by Alexander Gardner. The identity of the boy has always been a puzzle for researchers. 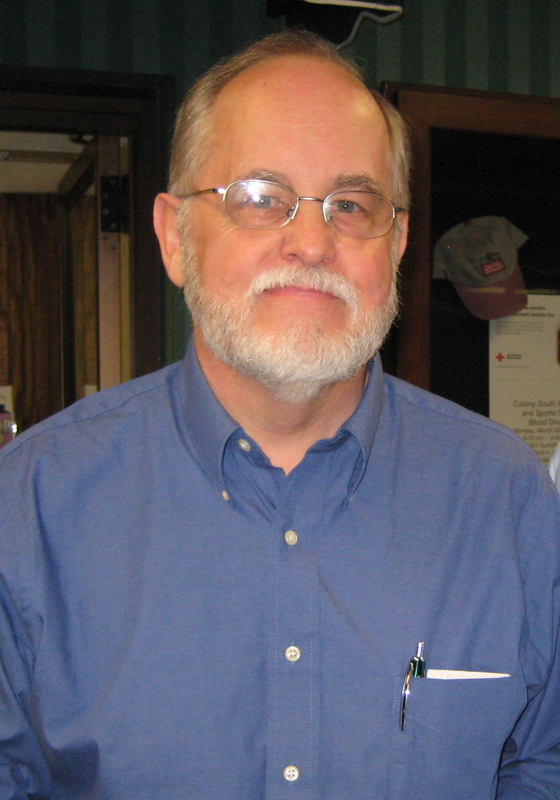 However, researcher Steven G. Miller published an article in 1993 which may have answered the question. As part of my 15 chapter series called “The Lincoln Conspirators Execution Photos, A Study In Detail“, plenty of questions have been raised by the photos. One puzzling image that caught my attention was the picture of a young boy standing in front of the scaffold in the photograph called “All is Done (1). I had the pleasure of conversing with Mr. Steven G. Miller, Lincoln assassination researcher/expert who specializes in the hunt for John Wilkes Booth. Roger Norton of the Abraham Lincoln Research Site says that Steven Miller is “probably the most knowledgeable Boston Corbett expert in the world”. Boston Corbett is the soldier who shot John Wilkes Booth at the Garrett farm. But back in 1993, Steven Miller’s focus was on the boy seen at the hanging. He published a paper in the Surratt Courier in which his research not only argued very convincingly as to the identity of the boy but also names him. It’s a great article and Mr. Miller has graciously allowed me to reproduce it here. I have added one correction [in brackets] regarding the sequence number in the Gardner series as being the fourth photograph. However, since 1993, other photos in the series have been discovered, so it is now considered number seven. Is this John C. Collins? Article from the Surratt Courier dated January 25, 1993.
Who Was The Boy At The Hanging? by Steven G. Miller. The most famous photograph of the execution of the Lincoln Conspirators is the one which shows the four bodies hanging limp and motionless on that hot July afternoon. The widely-reprinted image by photographer Alexander Gardner was the fourth [revised to seventh] in the series that he took that day. A close examination of this dramatic and grisly photo reveals a puzzle that had intrigued scholars for quite some time. The crowd has parted somewhat and right in the middle of the soldiers is a teenage boy in uniform. Who was this underaged spectator? Was he a drummer boy for a Veteran Reserve Corps Regiment, a camp-follower or the son of an officer stationed at the Old Penitentiary? Thanks to some pieces that just seemed to fall into place this micro-mystery may be solved at last. Michael Kauffman located an article called “Recollections of Boston Corbett” by John C. Collins from THE WASHINGTON STAR, April 12, 1914. Collins said that during the last two years of the war he was “the company boy,” a sort of regimental mascot, for the 16th New York Volunteer Cavalry. Unfortunately, John Collins wrote, William was wounded in a skirmish with Mosby’s men before John could be returned home. After a short hospital stay William returned to his regiment, only to be captured on June 24, 1864, in the same battle in which Boston Corbett was taken prisoner. Collins, Corbett and several others were shipped to the infamous prison at Andersonville, Georgia. With no one to take him back to New York John Collins was stranded with the regiment. He also said that he was present at the hanging of Mrs. Surratt and the others. His eyewitness account is particularly interesting. He tells of the strict security that was in evidence around the prison. Outside the walls was, he said, “a double line of soldiers for the entire length, standing by twos with bayonets touching one another.” There were guards at each entrance and signed passes were required for admittance. Who were William and John Collins? Is there any verification for this wonderful story? The records of the Sixteenth N.Y. Cavalry confirm that William Collins was a private in Company K. Prior to enlisting in the 16th he served in Company G, 28th New York Infantry. According to the regimental history of the 28th N.Y. Infantry John Collins was born September 28, 1843 in Albion, New York. He was in the 28th N.Y. from May 22, 1861 to June 2, 1863. During this time he was captured and paroled by the Confederates twice. He had been promoted to the rank of sergeant when he was mustered out. He reenlisted as a private in Company K, 16th N.Y.V.C. on June 20, 1863 and served until October 3, 1865. He returned to Albion and farmed there until his death in March 1904. The unit history of the 28th N.Y. said he was one of the members of the Garrett’s Farm Patrol and received a share of the Reward money, but this is incorrect. Pvt. Collins had close contacts with members of the Patrol but was not one of them, nor did he receive any Bounty. In the Doherty Archive is a letter from William Collins to John E. Hoover, Capt. Doherty’s nephew, written shortly after Doherty’s death. William Collins advised the family on how to obtain a pension for Doherty’s widow. He also wrote about Boston Corbett’s prison life in Andersonville and he mentioned the “bad blood””between the soldiers of the Garrett’s Farm Patrol and the Baker clan. Collins also told Hoover about John Collin’s presence at the Execution. William mentioned that his brother John was a graduate of Yale University. After the end of the war Collins attended the Normal School in Brockport, New York. He then moved to New Haven, Connecticut, where he founded the New Haven Boys Club in 1874, (“It was the first organization of its kind”, he later recalled) and served as director until 1877. He was instrumental in establishing the Boys Clubs in the U.S. and Canada and worked with that organization for many years. He enrolled in the Yale Divinity School and received a B.A. degree in 1875 and a B.D. in 1878. Collins served as an evangelist and missionary in Nebraska, superintendent of the New Haven Gospel Union, editor-publisher of THE GOSPEL UNION NEWS and director of the International Christian Workers Association. He died in New Haven on August 26, 1928 and was buried in Whitneyville, Conn.
William Collins wrote to Frank Hoover that Gen. Nelson Sweiter, commanding officer of the Sixteenth Cavalry, offered to nominate John Collins as a candidate to West Point, but that John wanted to attend religious school instead. What made him decide on this career? An important clue is found in the only recollection that John Collins wrote about the 16th N.Y. Cav., an article was mostly about Sergt. Corbett. Rev. Collins’ life-long dedication to religious and public service leads to one seemingly inescapable conclusion: that he chose this path directly because of the character and preaching of Boston Corbett. Corbett was a true believer and often inspired religious-minded people with his good works and suggestions of “divine direction.” Rev. Collins was a religious “do-er” not just a religious talker. This sounds like the kind of Christian of which Corbett would have approved. It seems certain that John C. Collins was the “company boy” of the 16th N.Y.V.C. and that he was present when the Conspirators were hanged. But was he the Boy in the Photo? How many other boys were there in uniform when the Lincoln Conspirators were executed? — Boyce, C.W., A BRIEF HISTORY OF THE TWENTY-EIGHTH REGIMENT NEW YORK STATE VOLUNTEERS, FIRST BRIGADE, TWELFTH CORPS, ARMY OF THE POTOMAC, etc. Buffalo, New York; C.W. Boyce, 1896. — Alexander Gardner, Execution of the Conspirators, “Photo No. 4,” “Incidents of the War” series. See, Katz, D. Mark, WITNESS TO AN ERA: THE LIFE AND PHOTOGRAPHY OF ALEXANDER GARDNER. N.Y.: Viking Press, 1991. Pg. 189. — “Recollections of Boston Corbett” by John C. Collins from THE WASHINGTON (D.C.) STAR, April 12, 1914. — “John C. Collins and Boxing. The New Venture of New Haven’s Versatile Ex-Clergyman.” SATURDAY CHRONICLE (New Haven, Conn.), August 5, 1911. — Collins, John C., “Starting Something For Boys. A Bit of Autobiography for a Purpose.” SATURDAY CHRONICLE (New Haven, Conn.), December 21 and 28, 1912. — William Collins letter to John E. Hoover, dated May 10, 1897, Edward P. Doherty Archive, Wm. Hallam Webber Collection. –Yale University’s Alumni Office, THE YALE OBITUARY RECORD 1928-29. New Haven, Conn. If you are interested in reading interviews by Lincoln scholars, experts, historians and even a Mary Todd Lincoln performer, please click on one of the interviews below.